FREE Sample Of Roux Fanci Full Temporary Hair Color! You are here: Home / beauty / FREE Sample Of Roux Fanci Full Temporary Hair Color! 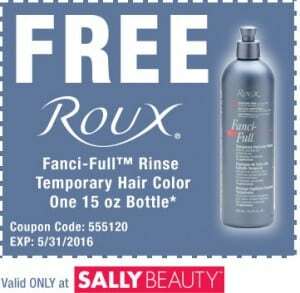 If you visit a Sally Beauty Supply shop near you, you can get a FREE bottle of Roux Fanci Full rinse temporary hair color. To get your freebie, just print this coupon and redeem it at a Sally Beauty Supply before May 31, 2016. You can find a Sally Beauty store near you on the website.